Adventure travel company Eleven Experience has an unofficial mission: to hear “that was the best day of my life” from their guests. 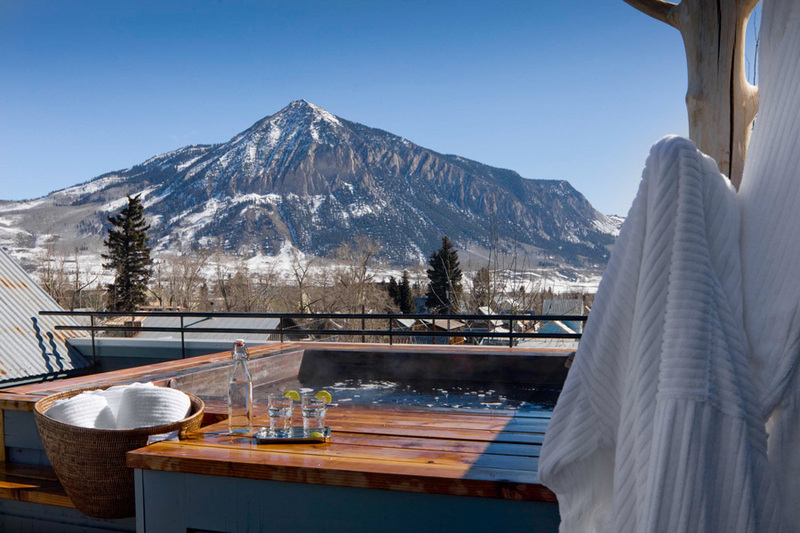 From the moment I woke up to a hot tub and a gourmet breakfast at Scarp Ridge Lodge, Eleven’s inimitable downtown Crested Butte property, those words were on my lips. Later that day, spurred by lap after lap of creamy powder under cobalt Colorado skies, those words came out uncontrollably — in the unintelligible yet unmistakable form of whoops and howls. Between luxury accommodations at Scarp Ridge Lodge and world-class cat-skiing with Eleven Guides, Eleven Experience has achieved ski vacation alchemy. Their spellbinding formula of unbelievable digs, mouth-watering cuisine, 5-star service, and grin-inducing guided skiing yields nothing short of pure gold. With Eleven, “best day ever” isn’t just a lofty goal — it’s a likely occurrence. Imagine this: you wake up in a four-poster bed to classic rock drifting out of surround sound speakers. Oxygen flows silently into the room, a welcome touch for those acclimating to 8,885 feet from sea level. Toss on a plush robe, reach into the mini fridge for an organic coconut water, and stumble out of your private suite onto the deck, where a copper hot tub bubbles away like a frothing Holy Grail of relaxation. Slip into the swirling mist as the snow falls. The sun rises, illuminating Mt. Crested Butte’s monolithic crown — the crooked and sacred sentinel of a summit that towers high above the idyllic little ski town. Once you’ve had your soak, it’s back to the suite for a quick steam shower. Then, after exchanging the robe for Gore-Tex, you follow the scent of roasted espresso and sizzling bacon to the dining room. The cushy Eleven Guides cat picks you up at the doorstep of Scarp Ridge Lodge. It’s surreal — loading the cat straight out of the hotel lobby and cruising through sleepy downtown Crested Butte. 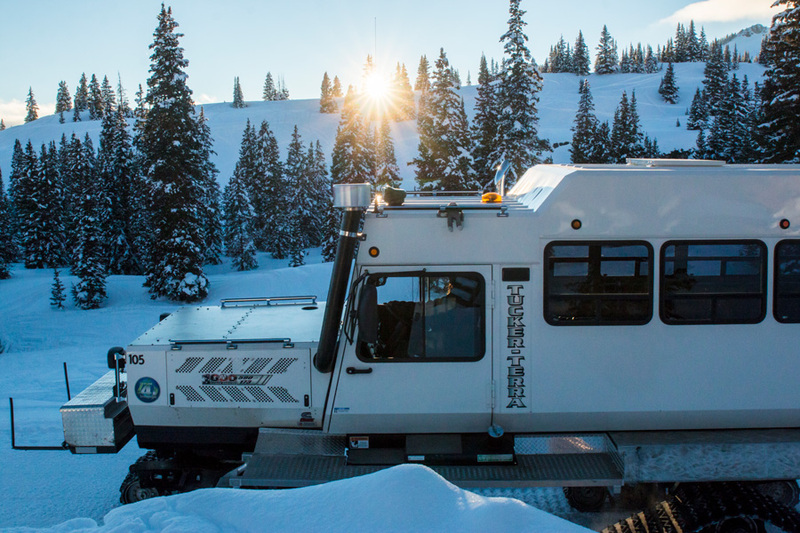 After watching a safety video, the ride to Irwin passes by quickly as you alternate between watching a TGR ski flick on the flat screen and Crested Butte’s lauded backcountry roll by through the windows. The cat drops you off at a cozy, upscale lodge at the base of Eleven's extensive cat-skiing operation. Inside, three expert ski guides await with two backcountry necessities: avalanche beacons and more espresso. They brief you on terrain, weather, and avalanche safety conditions while you tighten up your boots and load up on caffeine (not that you need it — the adrenaline is already flowing even though you haven’t taken a single turn). “Best Day Ever” officially becomes the mantra when the cat drops you off at the top of Scarp Ridge. You take in the views of the magnificent West Elk Range as the crew steps into skis and straps into snowboards. Heart rates increase. High-fives are traded. When the guides give the go-ahead, you link turn after turn through untracked powder. They call it a “warm-up run,” but your quads burn well before you reach the cat 1000+ feet below. An ear-to-ear grin is plastered across your face — and it’ll stay there all day long. The terrain at Irwin is varied: nearly every aspect, steepness, and type of terrain is available to you, and depending on group ability and the snow conditions, you can ski it all. Wide-open, mellow meadows? Sure. Well-spaced tree runs with a decent pitch? Done. Steep and tight chutes with mandatory cliff drops? If you can ski it, it’s there for the taking. And unlike traditional backcountry skiing, where nature is left to its own devices, the Eleven Guides team carefully mitigates avalanche risk through a comprehensive program of snowpack analysis, snow-packing crews, and strategic bombing. 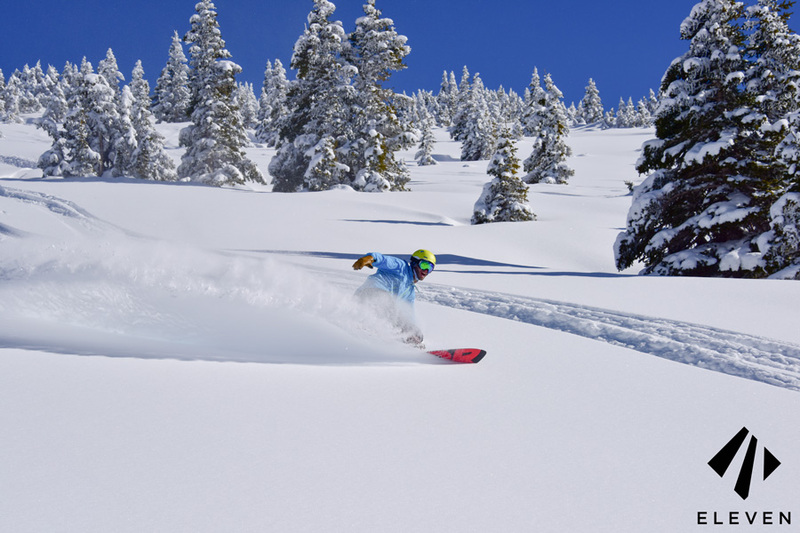 Not to mention, Eleven Guides also offers guiding backcountry skiing outside of their cat operation, so you can hire a professional guide to take you on ski tours in Irwin, Crested Butte, Monarch Pass, and beyond. Thanks to the efforts of these capable avalanche safety professionals, you’re free to focus your energy on what you came for: the skiing. Client experience is at the heart of Eleven’s mission: If you’d rather have a hot chocolate or a beer in the lodge, the hospitality team will gladly set you up. If you want to take it easy, guides will lead you down powder-laden glades that are sure to supply you with both face shots and endless smiles. If you’re itching to send it and the guides trust your skiing skills, they’ll put you on top of steep, technical lines that may very well be highlights of the season, if not your skiing career. They cater to your skill level and desires, lap after lap, run after run. And when it’s time for lunch, they cater to that, too, with a tasty spread rarely — if ever — eaten in the backcountry. For me, the uncontrollable howls (auditory affirmations of Best Day Ever status) were at their loudest after a run called N.C. Shooter off Barkmarker Glades. Following the advice of one of the guides, I edged over a blind rollover, took a sweeping turn, lined up a cliff flanked by aesthetic rock walls, and dropped the cliff. Upon landing, I picked up speed and straight-lined into the apron, hollering like a lunatic into the wind. It was euphoric, a line that I’ll never forget — namely because Eleven brings along a professional photographer to capture every moment. I look back at those photos now and three words come to mind: Best. Day. Ever. After skiing, the rest of the day is, simply put, icing on the cake. More ski movies and craft beer in a laughter-filled cat en-route back to Crested Butte, giddily emerging from a dreamy day of ski fantasies realized. An aprés beer and a snack of smoked trout back at the lodge. And to refuel? Choose between dinner downtown at one of Crested Butte’s many excellent restaurants, or a culinary symphony at the hands of a skilled conductor in the elegant comfort of the Scarp Ridge Lodge dining room. Then, to top it all off, you finish the day where you started: in a copper hot tub, underneath countless stars, Mt. Crested Butte’s iconic peak just visible in the moonlight.